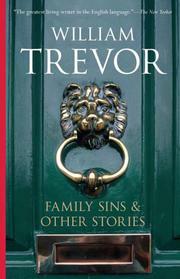 Throughout Trevor's series of collections of beautifully crafted, acute, and affecting short stories, there has never been that outcropping of self-parody that is apt to afflict the work of prolific practitioners of such a confining art form. Each of Trevor's Fate-shackled characters who loiter into a twilight sadness--or bemused acceptance of Things-As-They-Inexplicably-Are--is a fully realized, breathing being who occupies unique space and time. Here, men and women struggle within the labyrinth of family--with its indelible stains from the past and its present imperatives for predator and prey. In the title story, a grandfather's cruelty is amplified and adapted by a grandson and visited upon a vulnerable girl. The daughter of a suicide in "In Love with Ariadne" lives in the shadow of her father's sin and shame. Then public shame scorches two rural families whose security is community reputation: in "A Husband's Return," family "silence" will deny a scandal, but will also doom compassion and love; an aging couple in "Events at Drimaghleen," whose tragedy was absorbed by respectful and sympathetic neighbors, is victimized by a team of brass-headed journalists to find themselves uprooted, exposed in scandal. Fathers also unwittingly wound children: a young girl is hired out for a hated servant's job while her dear dad gains a longed-for field; and a headmaster's son bears the crushing burden of his family's honor among violent-minded schoolboys. Love, or its souring, is sometimes cruel, too--"unsuitable." A single woman reflects on one brief, long-ago idyll with a married man: "For both of them, the pattern of their lives has formed around a moment in an afternoon." In another tale, a man sent by his estranged wife to discuss future plans with her apparently future husband (who's rather a fathead) turns some screws, boozily enjoying himself in a bar, but at last cannot release his lying, impossible wife--and he doesn't know why. Another fine collection by this Irish author, here centering on the plight of people held fast by the familial network of peculiar tensions that can both hold and strangle.